It is not strange that the matter of overfeeding has lodged itself at the core of many nutrition debates. Overfeeding address the very question of what makes us fat and how we fatten. But overfeeding studies do not fit nicely into the «calories inn – calories out» dogma. In fact, the finding that overfeeding does not generally cause long term overweight, is used to argue that it is what we eat, as opposed to how much, that determines how much weight we gain. The logic is that what we eat affects how much we eat, how much we burn and how we feel and so on. If different types of food affect how energetic we feel, as we know they can, and this effect is independent of energy content, then calories do not seem worth counting. The whole subject of overfeeding is extremely interesting, but it requires some careful tongue in cheek navigation through a minefield of twisted logic and rhetoric traps. For example, is overfeeding even relevant to the normal physiology of overweight and obesity? And even if subjects in studies are not «force fed» but rather make a small effort to overeat, can it tell us what causes obesity? And if we accept that dietary composition matter in a normal diet, then composition matters in overfeeding as well. Do we then know what component of the diet is responsible for weight gain? Body weight is definitely regulated, and as it seems, quite tightly so. Most people are relatively weight stable most of the time, despite large variations in day to day energy expenditure and energy intake. An age-related drift in body weight has been estimated to about half a pound per year. David Weigle calculates that if the cost of depositing this ½ pound is 1560 kcal and that the caloric intake of an average individual is approximately 900,000 kcal per year, this weight gain represents an excess energy consumption of less than 0.2% . This number is simply too small to conclude that body weight is something we are in control of. Counting calories just does not make any sense, because our body is in charge, not our mind. But the fact that body weight is tightly regulated does not mean it is unchangeable. We know it’s not. Losing weight can be quite easy. This means that the mechanisms that regulate body weight (or rather fatness) are the very mechanisms we alter when we lose weight and so those mechanisms are easily manipulated. Gaining weight, at least in a speed equaling the speed at which we can lose weight, is close to impossible. The main reason is that overfeeding makes us full. A near complete suppression of appetite has been observed in both human and animal subjects [1,4,6,7]. For example, in one study, normal weight men were overfed by 1000 kcal per day for 21 days. This produced a mean fat gain of 79 grams per day. The voluntary caloric intake over the first 10 days after the end of the overfeeding, was reduced by 476 kcal per day relative to baseline. In one study where rats were overfed to achieve twice the body weight of control animals, two obese rats were kept at a temperature of 5 degrees Celsius (which is a temperature that requires the rats to burn more energy for heat production), and yet did not consume food for 11 and 16 days. The animals started eating again once they were down to their original weight. Extra energy ingested during overfeeding does not simply become stored. That is, some does. But one common consequence of overfeeding is increased energy expenditure. In a study by Leibel and coworkers, both obese and lean subjects were overfed and kept at 10% increased bodyweight compared to normal. This caused an increase in energy expenditure of 9kcal per kilo fat free mass in the lean and 8kcal in the obese . Because not all extra energy is stored, weight changes in response to overfeeding are generally small. Still, large individual variation is common [10-12] and this variation is important to consider. There are many proposed mechanisms for the individual variation, such as different mitochondrial efficiency, compliance to diet and differences in digestion. Of course, the amount of overfeeding is often calculated based on self-reported food intake prior to overfeeding. This may also be a source of error and underreporting may explain some of the individual differences. People with a family history of diabetes experience larger detrimental effects from overfeeding than people without , which illustrates how our genes determine our potential for disease and weight gain. One of the more famous of overfeeding studies, which resulted in a pile of articles, was conducted by Claude Bouchard in 1990 . To see if there really were differences in how individuals responded to overfeeding and to see if this difference was due to different genotypes, he used 12 pairs of monozygotic twins. They were overfed by 1000 kcal, six days a week for 84 days. On average this resulted in 8.1kg (2,7kg of which was lean body mass) gained weight. But the range was from 4,3kg to 13,3kg. The twins gained the same amount of weight, in the same way, and thus showed the importance of genes. But the large variation between twin pairs in response to overfeeding is interesting. The Bouchard study also found that the twins with the most type 1 muscle fibers, the slow fat burning type, gained the least fat. It might seem that skeletal muscle oxidative capacity in part predicts weight gain . 4 months after the overfeeding, the twins had lost 7 of the 8 kilos gained, but at a 5 year follow-up mean weight had increased by 5kg. This was however likely the result of the younger twins (youngest pairs were 19y) adding some normal late pubertal weight. And, although Bouchard and coworkers seemed somewhat surprised by it, the study found that there was no correlation between the total energy ingested and weight gained. In overfeeding, as in normal feeding, results depend on the type of nutrient consumed. Overfeeding on carbohydrate affects the body differently from overfeeding on fat and different fats and carbohydrates will, theoretically, affect us differently. One of the most extreme overfeeding rituals is that of the Cameroonian Guru Walla. In the Guru Walla, young men consume a diet made of red sorghum and cow milk (makes up over 95% of calories). The young men isolate themselves in different houses with a female attendant devoted exclusively to the preparation of Guru Walla meals. The diet and exclusion is supposed to lead to a certain level of purity. The men eat every 3 hour for 60 days, during which time body-weight can increase by an average of 17kg . The ritual food is truly a high carb diet, with 70% CHO, 15% fat and 15% protein. Despite their large weight gain, the excess weight is lost after the ritual ends. Patrick Pasquet writes about the long term effects of the Guru Walla: «Thus, 2.5 y after cessation of fattening there was a spontaneous return to initial body weight and body composition of the overfed subjects.» Pasquet almost had his nice stats ruined by one Cameroonian getting married and not losing as much weight as the other subjects: «Eight of them did not change daily life patterns and food habits in relation to the pre overfeeding period. One subject got married in the meantime; interestingly, for this subject some persistent overweight was left (6.7 of a 19.7kg gain).»  Marriage is of course a common accelerator of weight gain. In a crossover study from 1995, led by Tracy Horton , lean and obese subjects were overfed on either fat or carbohydrate for 2 weeks. All subjects gained a similar amount of weight on both overfeeding strategies, and post overfeeding body weight gradually came back to baseline in both groups. But measurements showed that energy expenditure was increased more with carbohydrates than fat. This is likely because the body tries to burn off as much glucose as possible to keep from getting dangerously high blood glucose, while increased fat intake is not as dangerous, and there is thus less need for increasing oxidation of it. 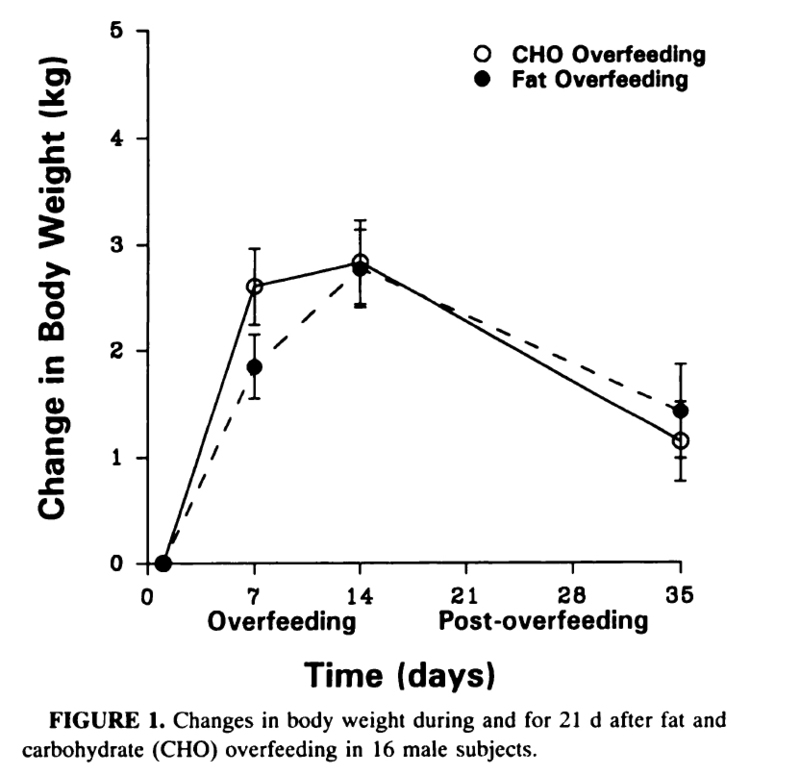 There were also indications of more energy being stored with fat overfeeding than with carb overfeeding. Lean and obese subjects responded similarly to overfeeding, although not surprisingly, the obese had a higher proportional oxidization of carbohydrate on both strategies. The obese are commonly recognized by the fact that they are carbohydrate burners rather than fat burners . Although the researchers does not mention it, table 3 shows that carbohydrate overfeeding caused greatly increased fasting insulin concentration in both lean and obese subjects. 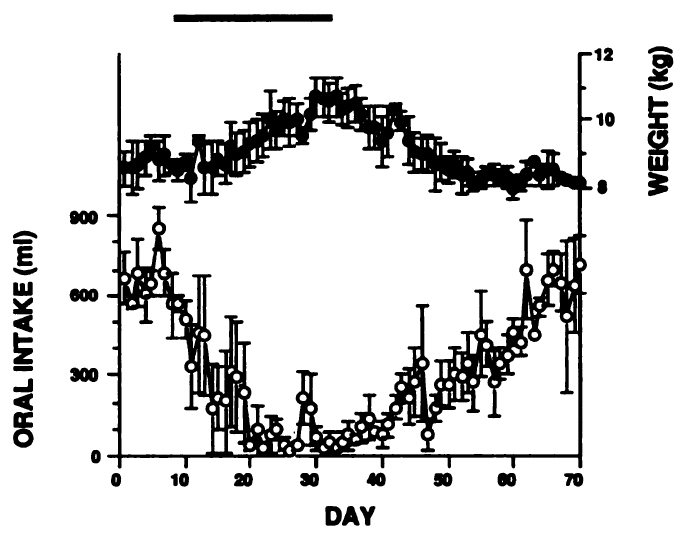 But fat overfeeding halved insulin in the lean and doubled it in the obese. It is also strange that the lean subjects had much higher insulin before fat overfeeding than before carbohydrate overfeeding. As this was a crossover study the results should be interpreted with caution. Danish researcher Ole Lammert, and colleagues, also compared carbohydrate and fat overfeeding . No significant difference in carbohydrate (78% carbohydrates, 11% protein, 11% fat) and fat 58% fat, 11% protein, 31% carbohydrate) were found after 21 days overfeeding. Both groups gained 1,5kg of weight. When we eat carbohydrates, much can be stored in muscles and liver as glycogen, but as soon as these stores are saturated, carbohydrate oxidation increases and de novo lipogenesis (conversion of carbohydrates to fat) increases . In one study, extreme carbohydrate overfeeding caused subjects to burn 400g of carbs per day, without exercising. And resting energy expenditure increased by 35%. Fasting glucose levels did not increase, which shows the body’s great ability (in lean subjects) to convert glucose to fat so as to keep blood glucose low. In addition, the study showed that going from a low fat diet to eating a high carb (86%) overfeeding diet, can bring your triglycerides from 0,8 mmol/l to a whopping 8,6 mmol/l, which is an astonishing feat. Body weight change in both lean and obese subjects in the Horton study. As usual, once overfeeding is finished, food intake and body weight goes down. You could theorize that the reduction in body weight post overfeeding is caused by the subjects wanting to lose the newly gained weight. But as the reaction is the same in many other animal species, it is likely a natural physiologic response. It is interesting that overfeeding also can cause quite an increase in lean body mass, sometimes half the weight gained [11,12]. Only 64-75% of the 17 kg weight gained during the Guru Walla is fat mass . In the Vermont prison overfeeding study, inmates increased their body weight by 16,2kg of which 10.4kg was determined to be fat. This does not mean that overeating is a good or way to build muscles, but there is much indication that if you want optimal muscle growth, you shouldn’t hold back on food intake. Weight gained as fat can be either hyperplasia (new cells) or hypertrophy (increased cell size). A 2010 study found that 8 weeks overfeeding in 28 healthy normal weight adults led to an obvious increase in fat cell size, but also an increase in fat cell number . Weight gain from overfeeding is not large. In fact, we could say that overfeeding works about as well at increasing body weight as energy restriction works at decreasing it. People do gain weight by voluntary overfeeding themselves or being force fed, but as soon as subjects return to their regular diet, the newly gained weight is quickly lost. This finding is one important reason the set point hypothesis emerged. What part of the diet is mostly responsible for the weight gain is difficult to say, but it is not likely easy to overeat on a low carbohydrate diet. Overfeeding is not healthy, and one important reason for the observed increased energy expenditure, is likely the body desperately trying to keep blood glucose down. Overfeeding pushes the body’s equilibrium towards increased fat storage, but in animals and humans alike, once normal feeding commences, the equilibrium is once again restored at the original body weight. It is also clear that although most of the surplus energy is stored, quite a large part is used to increase energy expenditure, and so it is difficult to calculate weight gain or fat gain from calories consumed as food. In other words, more energy (calories) increases body weight, but the processes of energy storage and expenditure are too complex for it to make any sense to count calories. 1. Sims EA, Danforth E Jr, Horton ES, Bray GA, Glennon JA, Salans LB: Endocrine and metabolic effects of experimental obesity in man. Recent Prog Horm Res 1973, 29: 457-496. 2. Flatt JP: Issues and misconceptions about obesity. Obesity (Silver Spring) 2011, 19: 676-686. 3. Galgani J, Ravussin E: Energy metabolism, fuel selection and body weight regulation. Int J Obes (Lond) 2008, 32 Suppl 7: S109-S119. 4. Weigle DS: Appetite and the regulation of body composition. FASEB J 1994, 8: 302-310. 5. Tappy L: Metabolic consequences of overfeeding in humans. Curr Opin Clin Nutr Metab Care 2004, 7: 623-628. 6. Roberts SB, Young VR, Fuss P, Fiatarone MA, Richard B, Rasmussen H, Wagner D, Joseph L, Holehouse E, Evans WJ: Energy expenditure and subsequent nutrient intakes in overfed young men. Am J Physiol 1990, 259: R461-R469. 7. Bessesen DH, Bull S, Cornier MA: Trafficking of dietary fat and resistance to obesity. Physiol Behav 2008, 94: 681-688. 8. Leibel RL, Rosenbaum M, Hirsch J: Changes in energy expenditure resulting from altered body weight. N Engl J Med 1995, 332: 621-628. 10. Stock MJ: Gluttony and thermogenesis revisited. Int J Obes Relat Metab Disord 1999, 23: 1105-1117. 11. Forbes GB, Brown MR, Welle SL, Lipinski BA: Deliberate overfeeding in women and men: energy cost and composition of the weight gain. Br J Nutr 1986, 56: 1-9. 12. Lammert O, Grunnet N, Faber P, Bjornsbo KS, Dich J, Larsen LO, Neese RA, Hellerstein MK, Quistorff B: Effects of isoenergetic overfeeding of either carbohydrate or fat in young men. Br J Nutr 2000, 84: 233-245. 13. Samocha-Bonet D, Campbell LV, Viardot A, Freund J, Tam CS, Greenfield JR, Heilbronn LK: A family history of type 2 diabetes increases risk factors associated with overfeeding. Diabetologia 2010, 53: 1700-1708. 14. Bouchard C, Tremblay A, Despres JP, Nadeau A, Lupien PJ, Theriault G, Dussault J, Moorjani S, Pinault S, Fournier G: The response to long-term overfeeding in identical twins. N Engl J Med 1990, 322: 1477-1482. 15. Sun G, Ukkola O, Rankinen T, Joanisse DR, Bouchard C: Skeletal muscle characteristics predict body fat gain in response to overfeeding in never-obese young men. Metabolism 2002, 51: 451-456. 16. Pasquet P, Brigant L, Froment A, Koppert GA, Bard D, de G, I, Apfelbaum M: Massive overfeeding and energy balance in men: the Guru Walla model. Am J Clin Nutr 1992, 56: 483-490. 17. 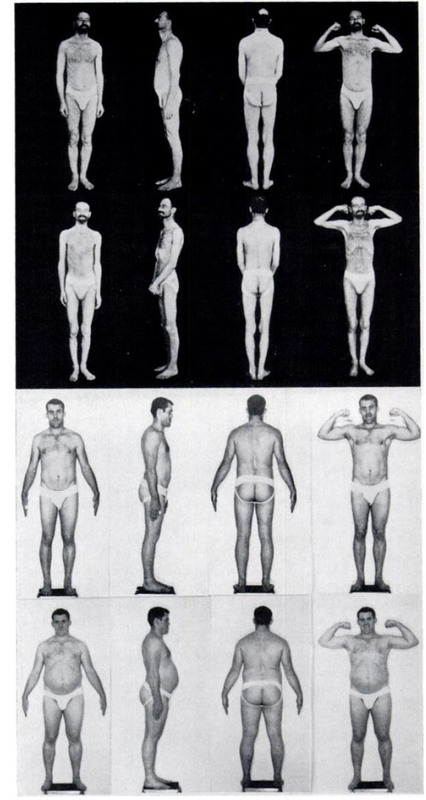 Pasquet P, Apfelbaum M: Recovery of initial body weight and composition after long-term massive overfeeding in men. Am J Clin Nutr 1994, 60: 861-863. 18. Horton TJ, Drougas H, Brachey A, Reed GW, Peters JC, Hill JO: Fat and carbohydrate overfeeding in humans: different effects on energy storage. Am J Clin Nutr 1995, 62: 19-29. 19. Zurlo F, Lillioja S, Esposito-Del Puente A, Nyomba BL, Raz I, Saad MF, Swinburn BA, Knowler WC, Bogardus C, Ravussin E: Low ratio of fat to carbohydrate oxidation as predictor of weight gain: study of 24-h RQ. Am J Physiol 1990, 259: E650-E657. 20. Acheson KJ, Schutz Y, Bessard T, Anantharaman K, Flatt JP, Jequier E: Glycogen storage capacity and de novo lipogenesis during massive carbohydrate overfeeding in man. Am J Clin Nutr 1988, 48: 240-247. 21. Tchoukalova YD, Votruba SB, Tchkonia T, Giorgadze N, Kirkland JL, Jensen MD: Regional differences in cellular mechanisms of adipose tissue gain with overfeeding. Proc Natl Acad Sci U S A 2010, 107: 18226-18231.
thanks for a great article — i'm posting a link to it on my FB page, as a good intro for people i know who still believe in CICO. i WAS going to ask you about your thoughts on the «setpoint hypothesis» but i see you wrote on it already, so i'll read that before i ask…. My view on the set-point hypothesis changes constantly. I consider the body to be composed of an almost endless amount of processes which affects each other in an almost endless amount of ways. All processes settle around an optimal point, or an equilibrium. The equilibrium can usually be manipulated to a certain degree, and processes can settle at different points. When it comes to body fat mass settling point we know it can be changed. How and how much is a matter of discussion. I've become much more active recently. I've been going out every night since February 9th and I intend to continue doing this. I can now eat whatever foods I want without lethargy, subsequent ravenous hunger, weight gain or body-fat gain. I don't pig-out. The Energy Balance Equation always applies. People become fat by eating more (for whatever reason) and moving about less (for whatever reason). OR… because we are storing more (for whatever reason) we are driven to eat more, and because we have less available energy (for whatever reason) we are demotivated to be physically active. Just as logically sound as your stated cause and effect and the First Law of Thermodynamic is still satisfied (it IS a physical law after all) but as discussed in the above blog post (did you read it?) the variables are far too many and mostly outside our conscious control, for calorie counting to be a practical solution to weight management — unless you happen to live in a closed metabolic ward… you don't do you? I don't necessarily see any need for central (brain) control to control a set-point… relatively simple homeostatic feedback processes in the periphery (body) can tend over time, to maintain equilibrium — much like a lake: with seasonal snowfall in the mountains that feed it via streams, and local variable rainfall, plus rivers running from the lake, evaporation etc… (all relatively simple processes) will tend to establish a waterline/shoreline that is fairly static. No I don't and I don't count calories. The moving around more happened before the eating more in my case. I have said «Calories count, but don’t bother counting them» in my blog (did you read it?). Sorry, but «because we are storing more (for whatever reason) we are driven to eat more» doesn't make sense. Energy output is obviously coupled to energy input in and as such cannot be treated independently as religious calorie counters incorrectly do. If human metabolism was to be modeled mathematically, it would look like a really ugly eigenvalue problem. If someone hasn't had formal training in mathematics and physics at a college level, that someone simply isn't qualified to count calories. I didn't realise that reading your blog was a prerequisite of commenting on one of Pal's posts? Obviously some form of energy balance is occurring — as above, it is a physical law — but your need to restate this obvious fact suggested to me that you do count calories. There are other physical laws involved in eating: gravity, motion etc… why are they never brought up? Possibly because they cannot be used to imply moral judgments such as the «gluttony and sloth» of the overweight. As a person who has been on the receiving end of such judgments (many coming from myself in my own ignorance) you'll pardon me if I object to such memes being disseminated. >> Sorry, but «because we are storing more (for whatever reason) we are driven to eat more» doesn't make sense. < < Does a teenager go through a growth spurt because they are eating more, or do they eat more because they are growing? Same energy balance but reversed cause and effect. I have never counted calories. Are you calling me a liar? I have never judged anybody for being fat – as you would know had you read my blog. Was that hint unsubtle enough for you? Not that old chestnut again. Most people get fat after their growth spurt. Do try harder. I need to put the first paragraph under the heading «Energy» on a business card and hand it to anyone who tells me «It's all about calories.» That paragraph cuts right to the heart of the absurdity (and tautology) of a singular focus on calorie consumption for weight maintenance–on top of the tendency of calorie counting to backfire when your goal is fat loss, rather than weight loss. I came here because I chose to read Pål's blog, not yours — is that hint subtle enough for you. The point about teenagers remains valid, it is an example of how hormone-mediated processes, within the body, can drive hunger… there are other examples for those open-minded enough to question the assumed cause and effect. Do we get fat because we overeat or do we overeat because we are getting fat..? I think it's important to realize that the body uses many, many feedback control systems. Some of them, like leptin or ghrelin were only recently discovered, well, I should say the hormones were recently discovered, it's hubristic to claim their FCSs are known. I'd even go so far as to say it's hubris to claim profound understanding of the insulin FCS, whether or not we are talking about its role in obesity, which is why I'm agnostic on the CIH. It does seem an appropriate stance. Especially as we constantly discover new interactions between and roles for these hormones. Overfeeding is for example an effective way of increasing leptin. 2) Don't make statements about me before checking the facts. Growth is essential and requires increased food consumption. Therefore, growth increases hunger so as to increase food consumption. Lots of body-fat isn't essential and can be harmful. Therefore, lots of body-fat doesn't increase hunger. It actually suppresses it via leptin. Hi Pal, could you help? Is rapid fat gain in the context of overfeeding after a situation of low T3 due to significant weight-loss on low carb a question of the body wanting to gain its lost fat, to get back to initial leptin levels or just detrimental effects from diabetes in the family or both? Not being able to get to the desired weight (55 instead of 59, the latter being my minimum lowest weight after weight gain) does it mean I can't settle at a lower point without my body opposing it? Frankly lightcan, I don't know. I would probably say, both, and more. There are even more factors than leptin and the detrimental effects of diabetes to consider. Lots of ifs and buts here. Was for example T3 low because of low carb or other factors? Something is definitely opposing weight loss (fat loss), but it would be very imprecise to say it's the body. Some, or all, of the processes working for fat gain is larger than those working for fat loss. What factors matter the most, or are the causal ones, is anybody's guess. that's what they usually say, after you lose a lot of weight expect it to come back on if you overeat. T3 was low because of more than 2 years on a low carb diet and weight loss of more than 35 kgs (not a lot for some people, it seems a lot for me) I stopped taking it in November. (When I started taking it in February last year,I didn't know that I should just increase my carbs or proteins, the doctor didn't either) I'm sure it's not low now. I haven't weighed myself since September last year, but I have to wear bigger trousers. I was very stressed and went back to eating the high reward foods that got me fat in the first place. (Not very clever, but I thought I had to focus on finishing my work no matter what the means were) In the beginning, I thought I wasn't overeating, but obviously I was after a few months. I have to find the strength to stop. There was a program yesterday on BBC on fat (Horizon) and they showed, among other things, that in identical twins, those who had more stress in their life compared to their twin, had the gene for becoming fat switched on. They also showed fMRIs of fat people's brains looking at rewarding foods compared to those of normal people looking at the same pictures of cakes and high fat foods. You know about the difference. It is definitely worth trying to reduce stress. Food isn't everything and I know a lot of people who don't stand a chance losing weight until they calm down. It's just one of those facts of life. We can never get a realistic result from dieting unless we also reduce high stress levels. Considered watching the horizon episode, but figured it probably was the same old dogma. Now I think I'm going to have to watch it anyway. Sounds interesting. Thanks for the tip. Thank you so much for the praise Marie. You're making me blush. I've little time for writing these days, but will hopefully be able to put some posts up in a while. There's so much interesting science that needs looking into. The Einstein quote is definitely worth remembering. Except the lepton receptor – there is an interesting speculation that hypothalmus counts «food electrons» or is it ATP ions. «Gazing down on the Jung Frau» – could only be from the Eiger, was not he one of the Trolltind? Don't know about the lepton receptor. Must be tiring work counting all those elementary particles. Funny you should mention that song. Actually been listening to it a lot recently. Eiger was never part of the Trolltind although at some level the Swizz mountains are connected to the Norwegian ones. I'm sure the Trolls have at one Ogre!!! !